This week’s round up of free crochet patterns offers some great small projects that you can work on! There are even a few that would make great stash busters! Keep scrolling for more after you have looked through these wonderful free crochet patterns! There are free crochet patterns being submitted by more talented crochet designers at the very bottom! Check out your favorites! Find even more free crochet patterns in past week’s link up parties here! Every other Monday, you will find a round up of the Top 5 Best Free Crochet Patterns! Plus, we (the hosts) will be sharing our own latest free crochet patterns on our blog. Throughout the week, links will be added so be sure to keep an eye on what others have to share as well! If you are a crochet blogger that has free patterns to share, this is a great party for you to get your work out there! Simply follow the instructions below to ‘link up’ your free crochet patterns each week. 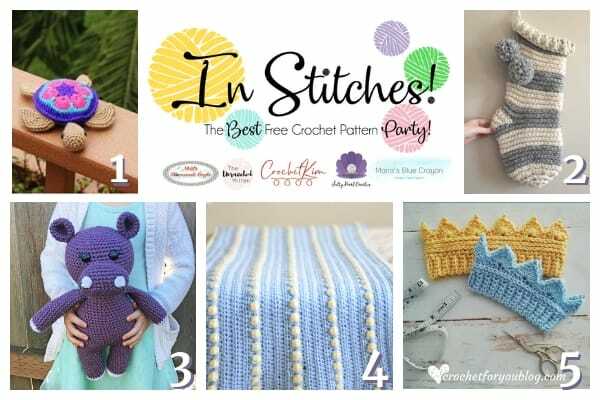 If you are in the top 5 (most clicked patterns), your pattern will be shared and promoted by all of the crochet bloggers hosting this party! You can find more details below. I am hosting this link up party right here on Maria’s Blue Crayon, as well as on, Nicki’s Handmade Crafts, Crochet Kim, Salty Pearl Crochet and The Unraveled Mitten. We are really excited to start this link up party and hope you join along! Be sure to check out our social media pages and follow us for more crochet patterns and inspiration! These free crochet patterns are from the hosts of the Link Up Party. This week, we have a new contributor that I think you will love! Scroll to the bottom to see the patterns being submitted and vote for your favorites by clicking on them! If you love a particular design, be sure to scroll up a bit and check out that designer’s blog and their social medias for more free patterns! 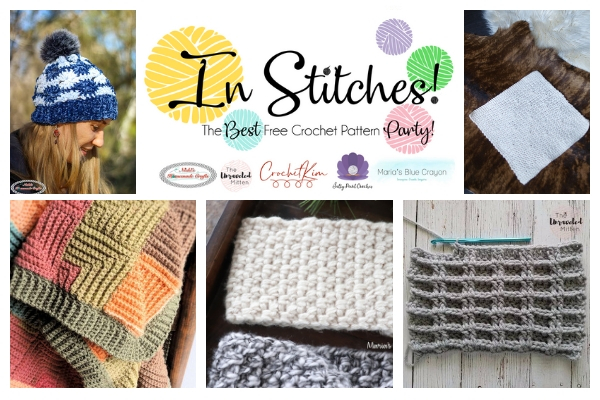 Ready to join In Stitches – The Best Free Crochet Pattern Party? Please visit at least one other link, you just might find a new favorite project! AND – your clicks are how we determine which projects to feature each week! Feel free to leave a comment at the pattern link to provide feedback and show support. No Etsy stores, Facebook pages, giveaways, or other link parties. Just blog posts to your actual crochet patterns that are accessible for FREE! Now let’s get this party started! Please remember that the links below are shown in random order and are not shown according to when they were submitted or how many votes they received so far.